This is the first part in an ongoing series where we'll rank the top 10 best fighters in each weight class. 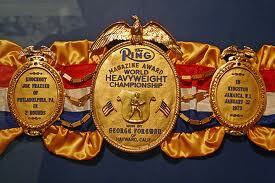 We'll start with heavyweight and work our way down, and then after a decent number of fights we'll revisit each list. Starting off with the heavyweight division is easy because number one, two, and to an extent three, are already picked for you. Nobody can look like past the Klitschkos for the top spots, and unless someone special comes along it’s going to stay that way for a few years. Let's take a look at the list. Just as a note, prolonged inactivity or a severe long-term injury will rule a fighter out. If a boxer has an upcoming fight scheduled however, he's right back in the game. I would gladly move Eddie further up the list and put him at number 6, maybe even 5 if he beats Adamek in their upcoming fight. Inactivity stops me doing that, and although it hasn't been Eddie's fault, I still have to factor it in. On his day I'd back him to beat anyone from 9 - 5 in this list. It's easy to forget about Arreola, but he was once a title challenger. He lost his way after losing to both Vitali Klitschko and Tomasz Adamek, but he seems to be back on form now. Since January 2011, Arreola has gone 7-0 and you can expect him to start taking big fights soon. Fury is undefeated, talented and be finally seems to be training properly (despite claims that in his last training camp there was only one boxer, and the other sparring partners were his brothers). Fury's biggest problem is that he takes easy fights. Who actually though Martin Rogan was going to win in their match last month? There's taking things slowly, and then there's going at a snail’s pace. Fury doesn't want to become another David Rodriguez and fill up a record sheet with exclusively journeymen. Pulev is undefeated after sixteen fights and he recently knocked out Alexander Dimitrenko to become the European champion. The Bulgarian still has his doubters, but he is slowly winning them over. There are rumours that he'll be fighting Tyson Fury soon. I expect this to be the most controversial placing of the list - putting a fighter above the guy who beat him less than a year earlier. Chisora is on a streak of 3 losses, but that doesn't tell the full story. In his last two fights Chisora has all-but beaten Robert Helenius and he put in a performance against Vitali Klitschko that he can be proud of. Although still undefeated, Tyson Fury hasn't done any of that, and that is why Chisora ranks above him. Adamek has only fought once since his loss to Vitali Klitschko last year, but the cruiserweight-turned-heavyweight is still one of the most talented boxers on this list. Stepping up a division and having your first fight against the best in the world is tough for anyone, and I think Adamek just needs to find his feet in the division. Now that he's officially out of retirement, David Haye can get ranked again. He deserves a place in the top five heavyweights, but I think Alexander Povetkin pips him to the number three slot. Povetkin has been more active and has come through a couple of tough tests over the last year. If Haye beats Chisora in July, that may change. Povetkin is quite accomplished. He's still undefeated after 24 fights, and he is technically a world champion. He has beaten Ruslan Chagaev and this year had a great fight with Marco Huck, where he was lucky to walk out with his belt. Povetkin gets number three spot, but that could change with David Haye's re-emergence in the division. I'd love to see Povetkin fight Haye, with the winner getting a shot at Vitali. What is there to say about Wlad? He's a three-belt world champion, a pound-for-pound top ten and can stake a great claim to be the number one heavyweight. I think he's slightly behind Vitali in terms of skill, and that is why he's at number two.